I Buy Way Too Many Records Dot Com: Sun Of A Gun - Co-Pay 7"
This was sent to me to review along with a couple of releases from Randy records (more on those coming soon). It's always neat to me to get a record sent to me here and there from bands and labels that I already enjoy. 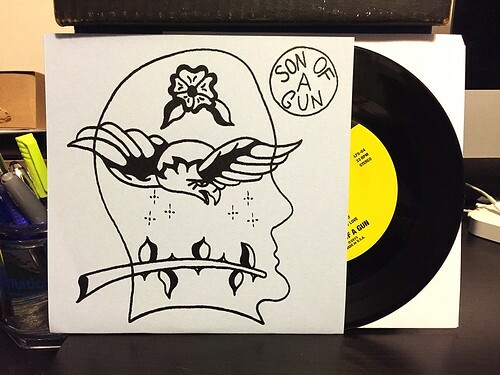 I really dug Son of a Gun's LP on Tall Pat records and this 7" has four more songs from this Chicago based band. If there is one thing Chicago seems to have a pretty decent supply of, it's great bands. Not sure what is in the water, but if you like your rock sounding a little fuzzy, but with big hooks, Chicago is a town you may want to check out. Especially if Son of a Gun is playing a show. These guys harness the bygone era of trashy rock and roll, yet they always manage to sound fresh and exciting where other bands could easily fall in the trappings of being a glorified tribute band. The four songs on this 7" are are natural progression from their last LP, with the two songs on the A side, "Co-Pay" and "All My Love" being a particular stand outs. Maybe I don't love the slower, but still quite fuzzy, "Do No Right" as much as the rest, but in general this is a fun little 7". Certainly worth picking up if you liked the album.